The Stoeger Cougar handgun is no stranger to me. Having been a Beretta fan for a lot of years now, the original model under that brand was mine around 9 years ago. That design under the former name of Beretta Cougar was discontinued by Beretta, then picked up by Stoeger when it was acquired by Beretta. Picking up the gun, you don't know you're not holding one of the original Cougars from Beretta. The gun comes in at a modest retail price and comes in packages from complete with two magazines, case, etc., to a bare bones version in a box with one magazine only. That's how I bought mine. I won't put the price I paid here, because I bought it where I work. 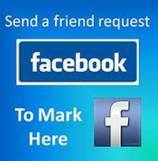 I purchased it at one of the lowest new retail prices in the nation plus a 20% discount. Had it been the former Beretta model it would have cost twice as much. For a gun that would have been exactly the same except for the name on the side. 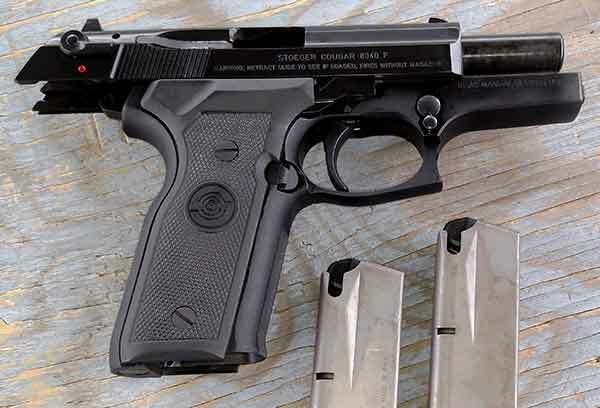 The Stoeger Cougar .40 S&W is a handsome, solid gun. It's hard not to just sit and look at it. The gun instills confidence when you grip it. The .40 caliber model carries 11 rounds in the magazine. The gun sports an ambidextrous, slide mounted combination safety and decocker. The action is double/single. The first shot is double action from the decocked condition. It is a long, heavy revolver-like shot with the rest of the shots being short, crisp single action. 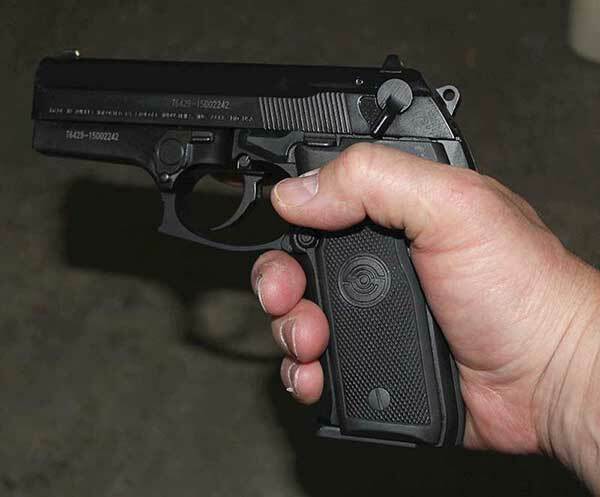 The signature rotating barrel design that serves to drive the gun backward into your palm instead of up and back makes for a solid, accurate, dependable defensive handgun. The barrel is 3.6" long, the sights 3-dot, all wrapped up in a metal alloy frame and steel slide with a nitride hardened finish that is the same as those on firearms issued to the U.S. Military. The grip will accommodate most hand sizes, though very small hands will have to adjust and grip as necessary. My daughter is under 5' 2" with hands that go with her size. She manages the gun just fine. But shooting it is what seals the deal. Put that package in your hand, line it up and fire. A gun that can be used for simple fun, learning to shoot. But more importantly a gun that can be confidently used to defend your life if needed. In our range tests, we used paper bullseye targets, silhouettes, and finally colored pieces of unmarked 8x11 paper for practical accuracy practice. Doesn't matter how you use it, it works for any application. The practical accuracy tests were most impressive and encouraging. Lining up the sights for the first shot, then firing till empty from 25-30 feet left paper with holes that had they been attackers would have been ruined. Shooting fast at the center of a silhouette left all rounds accounted for in what would be center mass. 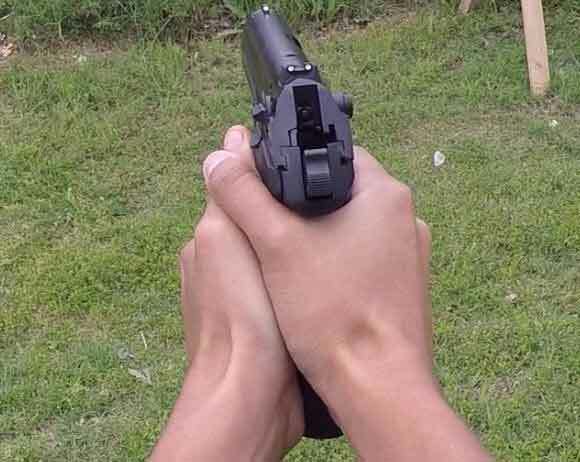 Everybody should work on practical accuracy with any defensive handgun. Once a determination was made that the gun was capable of accurate head shots if necessary, it's real purpose, practical self defense accuracy was established. 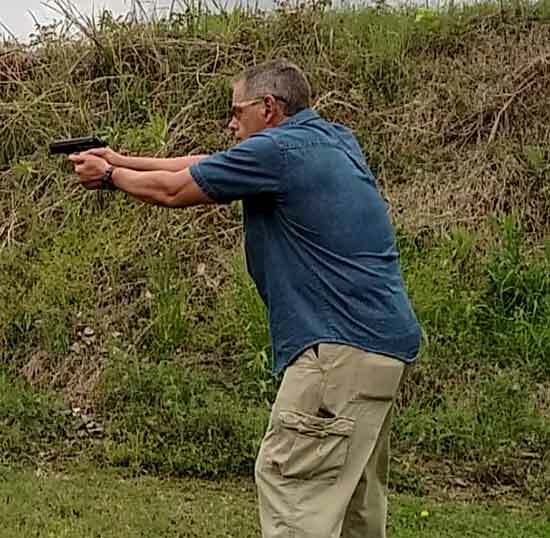 The gun is solid in the hand, and training with it showed that with my average shooting skills, center mass could be saturated with shots. Carrying this model takes some adjustments to clothing. It's a big gun, but can be carried by most in an inside the waistband holster with a good belt, and loose shirt or other cover garment. Versatility is the virtue of this or any DA/SA gun with decocker. The safety and decocker make it ideal for versatile carry when you may have to deholster and stow the gun in your vehicle. Home defense would be a clear choice with this great shooter. A gun you can decock and leave safely ready to fire. Quick into action, accurate, and easy to grip and control. The Stoeger Cougar .40 S&W Eats Whatever You Feed It. On the subject of dependability, as of this writing we have tested the gun with several different common brands of ball ammo, some self defense hollow points, and some of my .40 S&W reloads. At this point about 450 rounds have been run through it. Nothing but smooth running and bullets going where they're aimed. Exactly what you'd expect from a Beretta design. And a big plus is it worked right out of the box. No ridiculous "break in" period that many people know I abhor in any handgun. I've owned the Beretta Cougar 8000, the PX4 Storm, and this Stoeger Cougar .40 caliber pistol. I'm nothing but a fan of the design. In fact I'd bet my life on it with any of those guns. But this is the one that goes with me a great deal of the time now. 2019 Update: The Stoeger Cougar is still with me. A home defense gun, range gun, and an occasional carry gun out fishing or roaming the woods. Still performing flawlessly.